As we watch the relentless killing of Palestinians and the destruction of Gaza by Israel, it is easy to be distracted by the horror of the specific actions. Reportedly over 1200 have now been killed and who knows how many have been injured, not counting those whose homes have been destroyed. Social media allows you, if you choose, to monitor the horror of the Palestinians in real time. Some are calling @Farah_Gazan (Twitter address) a modern Anne Frank as this child reports her terror as the bombs fall around her and her expectation and acceptance that she could be killed at any moment. It is also easy to forget where this round of destruction began, with the death of 3 Israeli teenagers, quickly blamed on Hamas. When you use a little history and note that every major war in the last 100 years or more has been triggered by a false flag event, then you develop a scepticism for what is reported. And now it is being stated that Hamas was not responsible for the death of these teenagers after all, but supposedly some “lone cell” not under the command of the Hamas leadership. To me, this has false flag written all over it and has had from the beginning. And we have the United States gently criticising Israel for the bombing of a UN school, along with UN posturing over the attacks, whilst America restocks the Israeli military. Interestingly, we are perhaps seeing the greatest protests about the Israeli actions that we have seen, such as this protest in Germany and this announcement of 51 Israeli reservists refusing to join the destruction. In my view, you have to take a look at history to see what is happening, and the following map says it all. 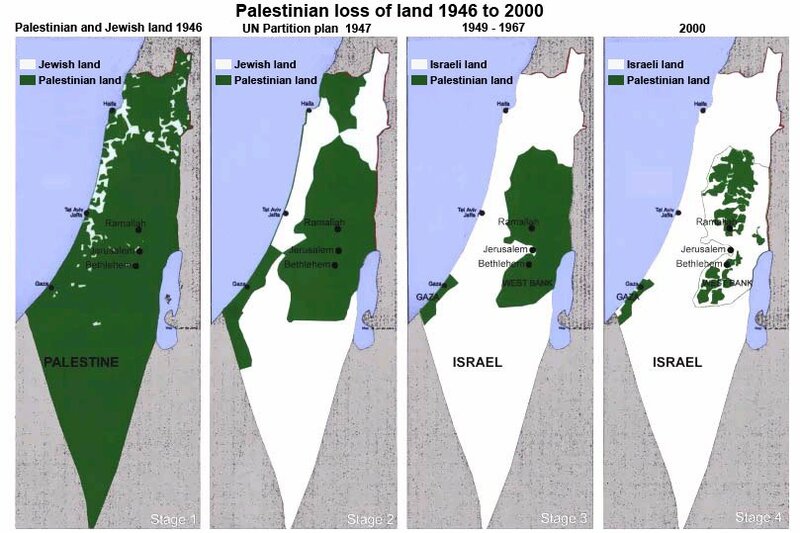 Israel is removing all Palestinian presence from the land they consider to be theirs. This attack on Gaza is simply the latest step down that path. They will not rest until the Palestinians are either killed or they give up and move, as those in the rest of what was Palestine have done since the 1930’s. We have all heard the loud voices proclaiming the historical right of the Israelis to this homeland, “given to them by God”. Does this claim have validity? I have written previously that I see Israel as a creation of the Rothschilds and a major project of theirs for the last century, and now the breathtaking scope of the myth creation around the moral right of Israel to exist has been laid bare by no less than an Israeli historian, Shlomo Sand, in his book entitled “The Invention of the Jewish People”. It makes sobering reading. Again I state that I am not criticising Jewish people here. The majority are but pawns in the Zionist game. In no way do I condone what is happening in Gaza at the moment – nor indeed what has been happening since the beginning of the last century – but unless we consider the broader context, we cannot understand what is actually happening here – the gradual elimination of Palestine, one invasion after another. Meanwhile the world wrings its hands and looks the other way whilst providing all of the arms, equipment and financial aid Israel needs to complete the task. Until people begin to look more deeply than the current action, they will not see the wood for the trees, which is exactly what those who run the game want.